Life in the Pitts: Carseat Safety! Let's save some tiny lives. Carseat Safety! Let's save some tiny lives. I hate seeing pictures of babies strapped in wrong. Do I say something, and come off like a jerk? Or just let it go, and risk injury to the child? Ugh, so awkward. Carseat Safety! Please share if you know someone who has a kid in a carseat. The chest adjuster goes over the breast bone, so it is even with their little armpits. The sternum is the strongest bone in the area, so their ribs are less likely to break. Also, if it is down too low, they can slide out if the car rolls. Babies have died this way. Now, tighten those straps until you can't pinch them, and put the handle back (most rear facers are designed to hit the seatback, to create a protective shell. Check your manual on this one!). And you're set. Drive safely! You can share this. I want you to. Save it, upload it, pin it, use it on your blog/twitter/old fashoined email mass forward. Just get it out there! It might save a precious little life. Plus, Syndil is wearing leg warmers. How cute is that? 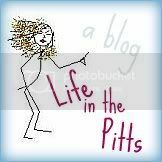 If you want to like/share this on Facebook, I have it on the Life in the Pitts fanpage. And I'm going to pin it on Pinterest. And you can retweet it. Here is a smaller picture, which you can copy and paste to embed it easily. Let's save some tiny lives together. 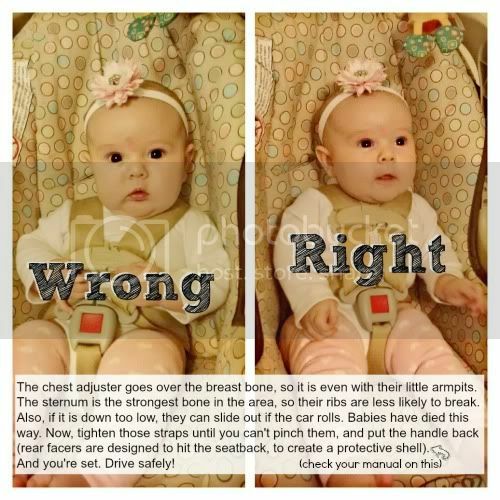 Do you have any carseat tips? Please add them in the comments!